PITTSBURGH (Reuters) - U.S. President Donald Trump, shrugging off objections from some critics that he was unwelcome, on Tuesday offered condolences at the Pittsburgh synagogue where 11 Jewish worshipers were shot to death as thousands of mourners attended the first funerals for victims of the massacre. The president, who opponents say has stoked a toxic political climate conducive to acts of violence, paid a brief visit to the Tree of Life temple, the scene of Saturday's attack, accompanied by first lady Melania Trump. 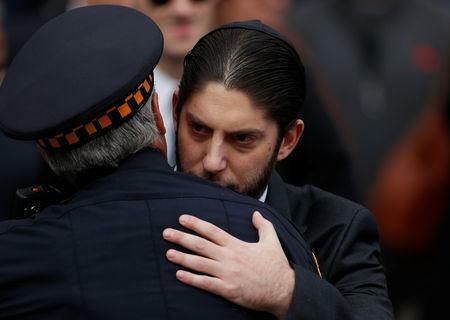 They were greeted by Rabbi Jeffrey Myers, who led them inside the temple. Emerging about 18 minutes later, the president went to a memorial outside the building, where the first lady placed a flower and the president placed a small stone on a marker for each of the shooting victims. Trump also planned to visit hospitalized police officers and other people wounded in Saturday's gun violence. 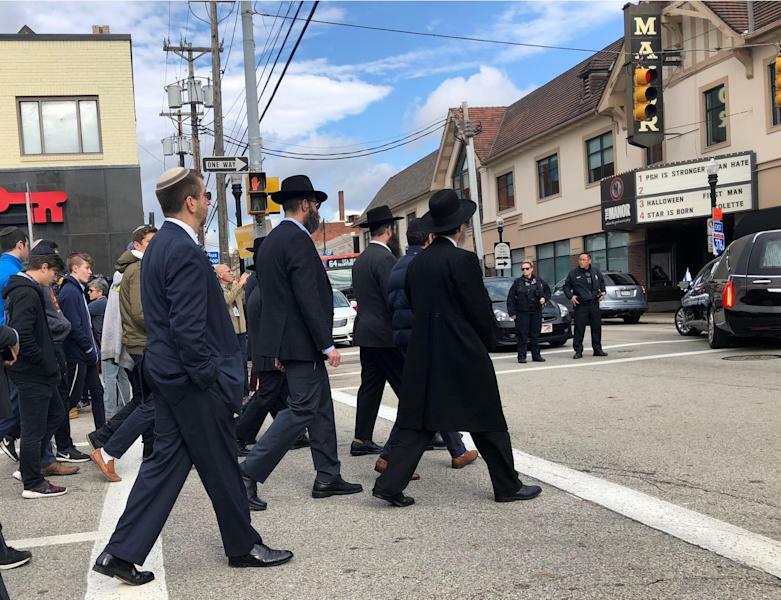 About 2,000 people, many of them members Pittsburgh's tight-knit Jewish community, held a protest march against Trump as his visit began, chanting, "Words have meaning," and carrying signs with such slogans as "We build bridges not walls." Also joining Trump on his trip to Pennsylvania's second-largest city were Ivanka Trump and Jared Kushner, his daughter and son-in-law who are Jewish and serve as White House advisers. Trump's visit came just seven days before elections that will determine whether his Republican Party will maintain its control in both houses of Congress or whether the Democrats will seize a majority in one chamber or both. The first funerals for the victims of the attack also were held on Tuesday. 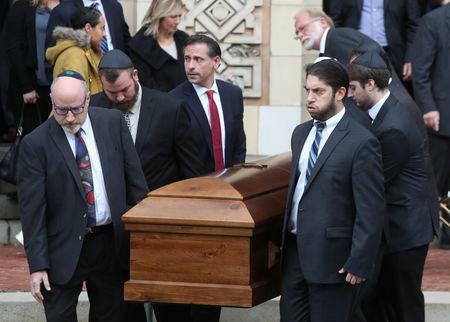 More than 1,800 people, some from across the United States, came to pay respects to relatives of David Rosenthal, 54, and Cecil Rosenthal, 59, at Rodef Shalom, another synagogue in the Squirrel Hill district that forms the heart of the city's Jewish community. Police officers were posted outside the temple. The two brothers, who lived at a home for people with disabilities, were among the 11 mostly elderly congregants killed when a gunman stormed into the Tree of Life synagogue and opened fire on worshipers, yelling, "All Jews must die." Services were also held for Jerry Rabinowitz, a 66-year-old family physician, and retiree Daniel Stein, 71. The crowd of about 2,000 at Rabinowitz's funeral included nurses dressed in their surgical scrubs. The accused gunman, Robert Bowers, 46, was arrested after he was wounded in a shootout with police. He has been charged with 29 federal felony counts, including hate crimes, and could face the death penalty if convicted. The attack - which the Anti-Defamation League (ADL) has described as the deadliest targeting Jews in U.S. history - has heightened a national debate over Trump's rhetoric, which critics say has contributed to a surge in white nationalist and neo-Nazi activity. The Trump administration has rejected the notion that he has encouraged far-right extremists who have embraced him.